Which Rookies Will Crack The Dallas Stars Roster? When you have an organization mired in the midst of a long-term rebuild, the ultimate goal is developing young players up to the point where they are ready to contribute and succeed at the NHL level. While scouting, drafting and monitoring a player’s progress through juniors and either the AHL or over in Europe is a task that requires plenty of oversight and planning, one of the most challenging aspects of developing a player is determining the best possible time for them to make the jump up the highest league in the sport, the NHL. It is by no means an exact science. Many promising junior superstars have had their confidence, and oftentimes their entire careers, ruined by being rushed into the NHL too soon and thrown into situations way over their heads. Likewise, other players have been developmentally stunted by being kept in the AHL for too long, or permanently lost to the European leagues where they became comfortable while never getting properly brought over to North America. One way or another, if a player is to become a valuable NHL contributor, they must make the jump sooner or later. The NHL regular season schedule was released on Friday. Check out our partners at TiqIQ for the best deals on Dallas Stars tickets for all 2013-14 games. The Dallas Stars have been rebuilding heavily for the last four years, so they have become very familiar with the process of graduating youngsters to the NHL. 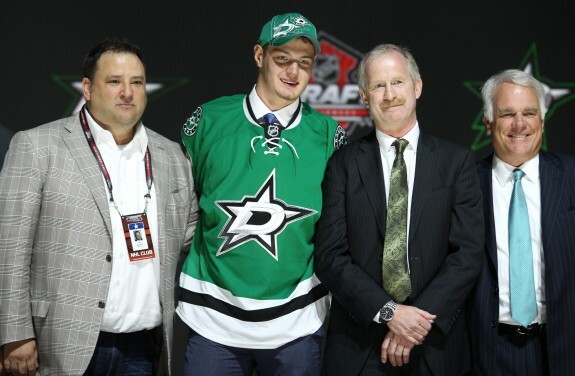 Jamie Benn and Brenden Dillon are Dallas’ two most noteworthy recently homegrown talents, while five other players – Antoine Roussel, Alex Chiasson, Jamie Oleksiak, Lane MacDermid and Cristopher Nilstorp – all made their NHL debuts in 2013. The franchise currently has a deep, balanced stockpile of prospects, many more of whom are reaching the point where they are ready to challenge for an NHL spot. With the 2013/2014 season beginning in the fall the Stars will once again be looking to try out a few new faces on their roster. Here now is a quick rundown of the top candidates, as well as a few wildcards that could also get the chance. Valeri Nichushkin: This one is a no-brainer. Nichushkin, selected 10th overall a month ago at the 2013 NHL Entry Draft, publicly stated before the draft that he wanted to play in the NHL in 2013/2014, and that he would go home to Russia for the year if he didn’t stick with his eventual club. Stars general manager Jim Nill is more than willing to oblige, saying that Nichushkin will “get every opportunity in the world to be on the team.” Whether or not he stays in Dallas for the entire season remains to be seen, but at this point it seems like a foregone conclusion that Nichushkin will at least make his NHL debut. Alex Chiasson: This one can also fall under the no-brainer category. Chiasson struggled in the AHL at the start of his first full professional season, but turned things around in the middle and then exploded near the end, scoring six goals and seven points in seven games with Dallas while playing primarily on the top line with Benn and Ray Whitney. The 22-year-old could still see some AHL time this season if he struggles, but will very likely be given the chance to once again play on Dallas’ top two lines. Lane MacDermid: Another player that is new to the Stars organization, MacDermid was acquired as part of the trade that sent Jaromir Jagr to the Boston Bruins at the deadline. MacDermid isn’t the flashiest of prospects, but plays the rough n’ tumble style of game that teams often love to deploy on their 4th lines, hitting everything in sight and occasionally dropping the gloves. He is still eligible to play in the AHL, but with free agent Eric Nystrom signing with the Nashville Predators the Stars lost out on some toughness, and could very easily rely on MacDermid to fill that gap. Jamie Oleksiak: Oleksiak suited up for 16 Stars games last season, but did so mostly out of necessity as Dallas’ blueline was wrecked by injuries and inconsistency. He struggled in the NHL, but excelled in his first year in the AHL, finishing with 33 points and a +19 in 59 games. Still only 20, Oleksiak will most likely spend most of the season as the #1 defenceman for Texas, which is probably the best possible thing for his development right now, but could still find himself in Dallas if his play warrants it or if emergency situations arise. Brett Ritchie: One of the top prospects in the system, Ritchie is coming off of a huge final junior season that saw him score 41 goals and 76 points in just 53 OHL games, as well as a combined six points in 14 AHL games after joining Texas at the end of the year. Possessing NHL-ready size at 6’4″ and roughly 215 pounds, Ritchie could easily get into a couple games with Dallas as a tryout, but won’t be rushed into action and will likely spend the entire season in the AHL unless he really excels. Colton Sceviour: A veteran of four AHL seasons and a guy that played for the Texas Stars in their inaugural year, it’s now or never for Sceviour. At 24 he is one of the oldest prospects in the system and is running out of time as younger, more high-profile players work their way into the picture. A versatile forward that can play wing or center, as well as powerplay and penalty kill, Sceviour could be a valuable depth player in Dallas that can plug a lot of different holes. He led Texas in scoring and plus-minus last season with 52 points and a +21 rating in 62 games, and has one assist in two career NHL games.